Sojourner’s Quest is a complete role-playing game published by Sojourner Games. 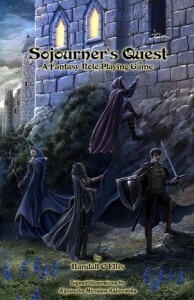 Sojourner’s Quest. It happens to be a standalone fantasy RPG that remembers old school gaming yet seeks a new and fresh perspective. I see it as simplified and daring; simplified in that the rules and tables are easy to keep track of, and daring because it’s an attempt to generate enthusiasm for the imagination once again. It challenges Players and Game Masters to take pride in gaming once more. Basically there were two reasons, both interwoven with each other: 1. I wanted to see if I could, and, 2. I needed to answer the complaints going against current RPGs. This game, I maintain, works, and just needs the exercise of imagination to let it soar. In 1978 Gary Gygax, through TSR, published AD&D. I am a purist. I stayed with that game, still do, yet the need to have a cleaner version of an RPG was needed; not the endless rules and incredible modifiers. The research was purely gaming for 34 years, what works as a writer of campaigns, and what keeps Players interested. It is, unfortunately, a low art budget project. There are a couple of really fine black and white illustrations, and the cover art is outstanding for the paperback. Agnieszka Miroslaw-Kalinowska is a marvelous artist! I really desire people to get back to having fun. With all of the worries and complaints against the larger companies, there has got to be a simpler answer than just throwing money and creative talent at a problem. It is not a problem! It is gaming; and that means clean fun and adventure. I cannot answer that question with any degree of intelligence; I could not know all of the other games. Hard question. I began with all of the tables: Combat Tables, Redemption Roll Tables, Spell Tables, and even how to roll up Character Skill Scores. Once that was completed, and I had an overall sense of how the game would flow, the rest seemed to be natural. I used common sense, and my years of playing the old school RPGs. In other words, I created as I went. I had few serious mathematical conundrums. It is more the way the logic of the game should flow, and what information belongs in the realm of the Players.